The answer was found in the combination of carbon fibers and a polymer resin, creating a very advanced nanomaterial, and structural super capacitors. The reinforced carbon fibers sandwich the new battery and are molded and formed to fit around the car’s frame, such as the door panels, the boot lid and wheel bowl, substantially saving on space. The carbon fiber laminate is first layered, shaped and then cured in an oven to set and harden. The super capacitors are integrated within the component skin. 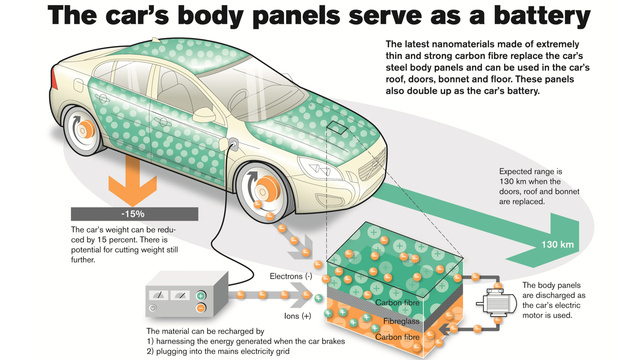 This material can then be used around the vehicle, replacing existing components, to store and charge energy.